Almost any profitable trader you know would often stress out the importance of journaling your trades. Everyone who started in trading had no idea what strategies work for them. Even though most of us would buy books, watch trading videos, read articles, or get mentored by the most experienced and venerable mentors, we would still end up losing money during the first phase of our trading journey. Why? Because no one starts consistently profitable in the market. A trading journal is undeniably a significant contributor to our success as traders. While newbie traders would stare at their P/Ls (profit/loss) with glee or dismay at night, an experienced trader would spend the night reflecting on his trades through his trading journal and studying what went right and wrong. Like professional athletes, we should conduct post-game analyses (our equivalent of journaling). Kobe Bryant, a famous NBA player, said that losing is ‘exciting’ because it gave him opportunities to be better. He said, “Whether you win or lose, you go back and you look, you find things you could’ve done better, find things you’ve done well, that worked.” He was a five-time NBA champion with the Los Angeles Lakers, so that speaks a lot for his ability to find value from his losses. Trading journals are like diaries. This is where you record your trade logs, jot down reasons you bought or sold the stock, and even write down your emotions during your trades. 1. It monitors progress: You’ll find out which setups are working and not. 2. It aids you in finding your edge: Your journal reveals whether you’re developing strengths and profitable strategies. 3. It expedites your learning curve: You’ll find areas where you should focus and develop upon. 4. It helps manage your emotions: By logging what you feel during the trade, you’ll understand more about your psychological weaknesses and strengths. 5. It helps find value on your losses: Your trading losses won’t just be ‘losses’ per se as you’ll learn plenty of lessons as to why you shouldn’t do something repeatedly. 6. It allows you to tweak your system: You’ll be able to adjust your entries, exits, sizing/allocation, and risk management, among others. 7. It serves to extrapolate your performance: Numbers don’t lie. Your trading journal will be an honest reflection of what and where you are right now as a trader. Did I set my stops correctly? Did I handle my emotions properly? How did I do in the last week/month/quarter? 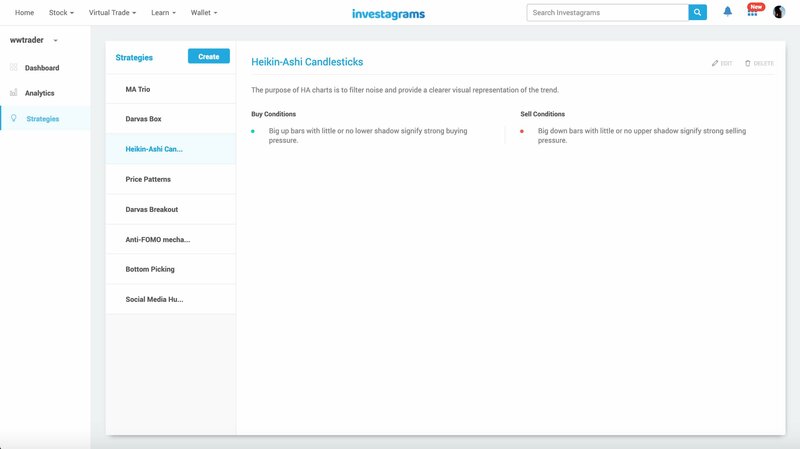 Or you can simply use InvestaJournal by Investagrams, which has basically every single tool a trader needs for a trading journal. 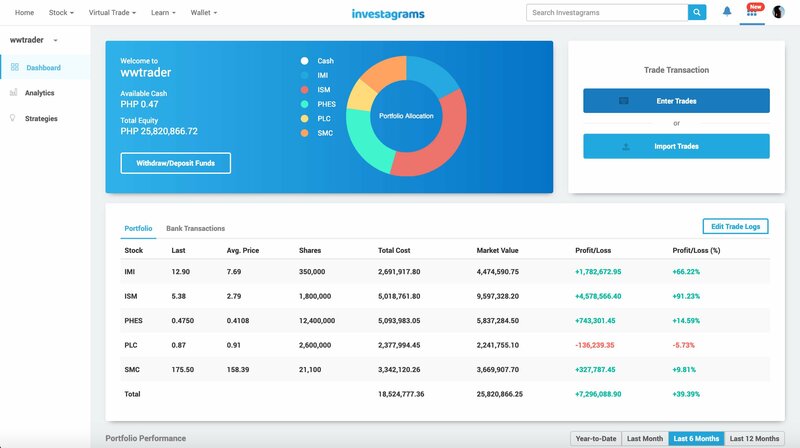 What is InvestaJournal and how do you use it? InvestaJournal is a feature-filled journal that the contemporary stock trader is looking for. It is an intuitive and easy-to-use feature that is essential for your development as a trader and investor. From start to profits you will be able to review your trades and performance using InvestaJournal. With its built-in analytics, you will develop a better EDGE as a trader. 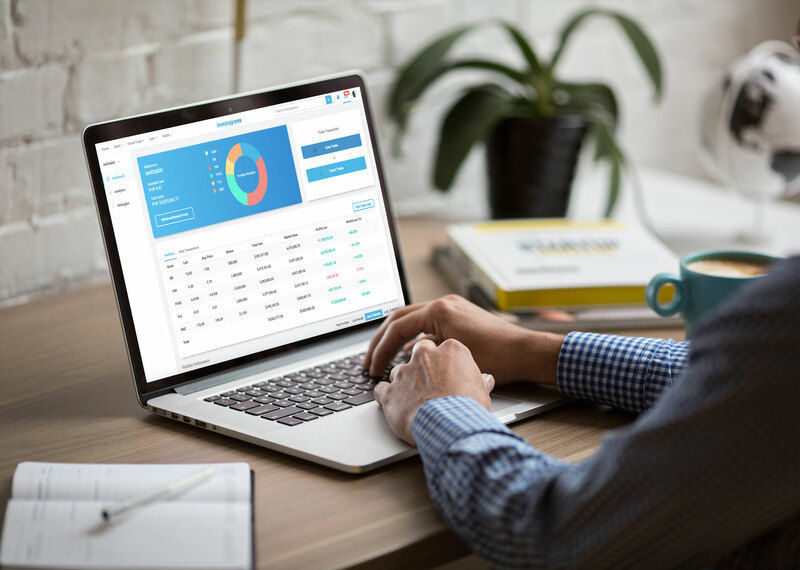 The dashboard is a complete and easy-to-use interface that lets you see the summary of all your trades information and displays everything you need to know about your trading performance. 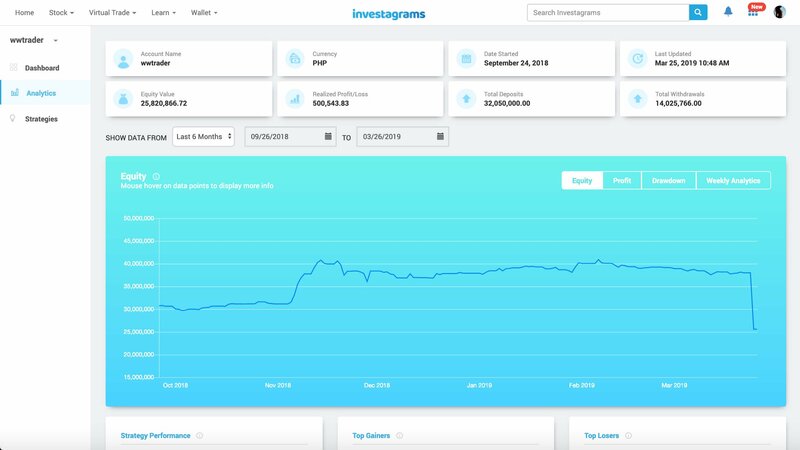 You can quickly see your portfolio allocation, your current positions, portfolio and strategy performance, trade analytics, and lastly, your top gainers and losers. The analytics tab is where you can analyze your trades without the need to compute for your trade statistics manually. From here, you can test and formulate your strategies and determine which ones to keep. Through statistical metrics, you will find your most powerful set-ups to use for your next trade. As it implies, this is where you’ll place the strategies that you use for each of your trades. Writing your strategies can develop various trading setups, incorporate in your trades, and track each trade’s performance. This is highly important so you’ll know whether a certain strategy is working in your favor or not. 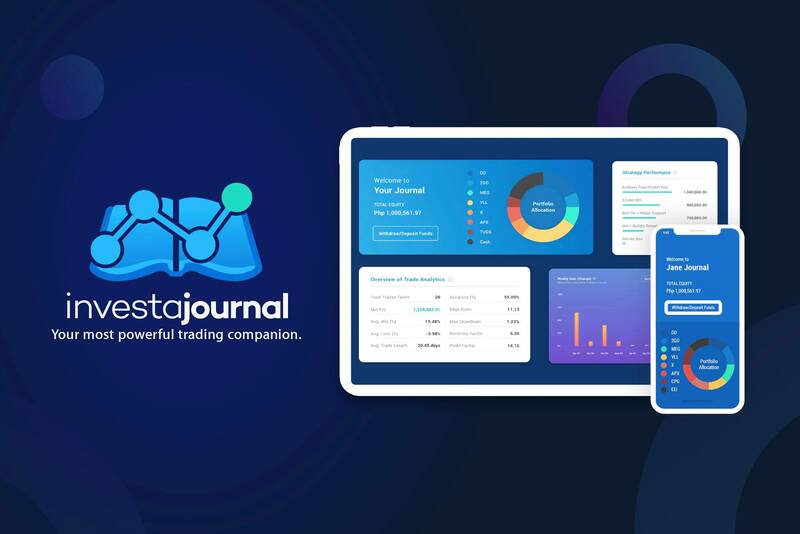 Additionally, InvestaJournal allows traders to easily log the trades by literally just copy-pasting data directly from our brokerage accounts. With its advanced and straightforward features, we can take our trading journey to the next level. Its ability to compute for analytics on our trades automatically will let us focus more on the parts where we’re doing well and where we’re not. Click here for more details about InvestaJournal. Writing a journal is easy. You just need to write or log the necessary data and that’s it. The tough part is in studying it with commitment and discipline. It’s the part in trading where you should “enjoy” your losses and learn from your mistakes. We make most of the effort when the market is closed. We tweak how we place our trades. We adjust our strategies accordingly to how we performed in the past. These are the parts where we’re in control as a trader. A word of advice: we cannot control our profits. We’re only in control of our decision-making and how we approach the market systematically.